For many years I’ve kept my eyes open for fast and easy ways to create dynamic timelines and it appears it is a concept who’s time has finally come. There are now many websites that let you create your own custom timelines and after checking out a few, I decided to create an Animation Timeline on Dipity. I’ve added all the Disney, Pixar, Dreamworks and Blue Sky feature films but I’m sure there are many more from years past that can be included. As a matter of fact, I wouldn’t mind having anything related to animation on there. I started it, but I won’t claim it as my own – it’s for all of us! Any one can contribute since it is editable by anyone. Just create an account on Dipity and add away. You can even edit the information that’s there if you want. It took me a while to get all the films in there, so I’m putting a bit of trust in your hands that you won’t maul it in to a work of evil, but I know you’re a good bunch and animation types generally watch out for each other. I would love it if individual events could be added from the accounts of these podcasts, but that is beyond my means. If anyone is willing, that would be very cool to see. Whatever happens, I thought it would be fun to share with you. For me the most striking view is to open the timeline full-screen (click the button in the lower left corner) to see the pattern of how many films were released over the years. (See the thumbnail above.) You can follow the boom after Snow White, the fallow years of the 50s and 60s, and then the explosion of releases in the last couple decades. As you can see, animation is booming and that’s great for all of us! Check it out and add to it if you’re inclined. That’s awesome. Thanks Clay! Is it possible to put links in their descriptions to direct viewers to that movie’s IMDB page for more information? I wouldn’t mind going through and helping out with that. Also I’m recalling a few great pages in The Illusion of Life that had timelines of the early years at Disney. I’ll try to get on that if I get some free time. I agree, awesome timeline Clay! I’d like to help contribute to the timeline too if that’s ok with you. YES! Please, collaborate as you wish. Let’s see how much it can hold. Wow, awesome time-line clay. I notice you didn’t add couple of Producer/director’s theater release. I’ll add Bluth’s stuff. But I was wondering what about Miyazaki? not adding him in the time-line seem odd. It’s would feel stranger if we added him without other Japanese animation. I see a small debate coming and thinking about it gives me a headache. I showed it to the guys and gals in the studio and they all started geeking out over it. Thanks for that. So far, I added Animal Farm, American Tail, Secret of N.I.M.H., Brave Little Toaster, Land Before Time & Ferngully. We should put Bakshi’s films up too. I don’t see them up on the Timeline yet, but maybe it takes some time for them to show up, or do you regulate them as they come through? J.W. – I would absolutely want to see Miyazaki films on there. I just didn’t have time to do more. (I made this over the course of a couple weeks while I was shooting out frames for my shots.) There shouldn’t be debate – it’s all animation baby! Andy – that’s great to hear. Michael – I see the new additions on there. Maybe it just takes a little time to update. Thanks for contributing!!! thanks clay, I only worry because the quantity of Japanese theatrical releases outnumber American with mix quality standard. Sure you get great ones like Akira or ghost in the shell, but you also get 12 Pokemon and 17 dragonball movies. So until someone bring up the subject. I’ll add the one that is not a theatrical product placement (in my opinion). j.w. – sure. Why don’t you just start with the ones you feel are most relevant and we can let our judgment guide us in to how deep we will go in to EVERY animated film ever. That timeline is gonna fill up in sooner than u think. Looks like this is really taking off. It is getting quite busy, but I think dipity does a good job of managing the clutter overall. I started at the end and am working backwards to add the IMDB links. Many thanks to whoever is adding the pics and videos to the more recent ones. Hopefully we can carry that out through the rest of the timeline. Good work so far. What an awesome idea!! I had no idea Brave Little Toaster wasn’t a Disney film: who produced it then? And what about adding all of the Rankin Bass films – I saw Lord of the Rings on there, but not the animagic films. Oh, heck: I just signed up and started adding things, so I hope no one minds. What info needs to go on each one? And where are the pictures coming from? I’ll update them. to Lorraine: I don’t think there is a set standard. I add the director’s name and IMDB address. others add image and videos. As long as it is a theatrical releases I think it would be fine. Please note that updates made for the timeline would take awhile to appear. questions: should we add Futureworld? I added a bunch of the movie posters earlier today, from around Gulliver’s Travels to A Goofy Movie (except a few inbetween that were already added). 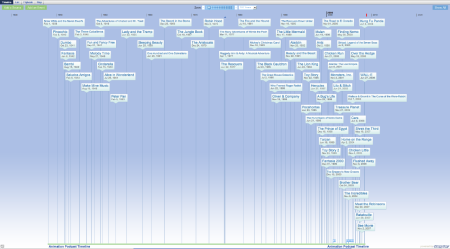 I also added Watership Down & Allegro non troppo to the timeline. Boy did that help the time pass by quick! This is such a great collaboration! Great work on everyone’s part! Interesting, how near the end there’s a sudden EXPLOSION of plus signs haha. Makes perfect sense though. That “second golden age” in the 1980’s really made an impact, eh? WHOA!!! You guys and gals rock. I went back to check the timeline and it has EXPLODED like Brian says. It has become quite education for me too. I had no idea so many animated films had been produced and then you see them all side by side and it’s a bit startiling. Isn’t it? Again, thanks everyone who has contributed to this project. It has quickly surpassed my expectations and when I put it up, there were about 200 views. Now it has passed 1500. I’ve been in contact with the good people at Dipity with some suggestions that will hopefully make it a more digestible guide with some sorting features. I hope they can do it. Wonderful great timeline and a good idea – but I’ve got withdrawal symptons from no show September!!!! AIEEEEEE!!!!!! I check in on your blog from time to time and saw this and my jaw dropped! I’ve recently started my quest to watch and study as many animated films/shorts as possible. I was going to use google and IMDB to help me with the task, but this is a life saver! Kudos to you Clay for starting this and everyone else for their great contributions! Clay, as you probably know word has spread that Glen Keane is no longer the director on Rapunzel. many have jumped to conclusions that Lasseter fire him and that we’d have a repeat of the Bolt mess. we now know that apparently he stepped down do to health issues and will become the animation director and exec producer instead. but I was wondering if you had anything to add. I figured you would since I hear the bolt team might be stepping in to finish the movie. is any of that true? are you doing anything on rapunzel? Glen Keane FIRED?! From direction?! Ah, frit! (homage to “Fat Albert”). You know, I looked on the Rapunzel page on Wiki and I don’t see any comic character stuff on this movie. The way we love Glen Keane is that he’s so emotional! He’s like George Scribner, who did “Oliver & Company”. George was originally going to direct “The Lion King”, but because he wanted to make the film very serious, he got taken off. Well, I think Mr. Keane was taken off of direction is because he wanted to make the movie serious. Don’t you think, Clay? I think there’s more to it than a health issue now, but it doesn’t sound like a mean spirited thing either. He just wasn’t able to dig himself out of the plot holes or whatever else was wrong with the story. I hear it started to fall apart after Rapunzel gets captured in her tower. ARGGHHHHHHH!!!! Clearly Clay’s really busy right now since its almost 2 months (sob) without a show… What’s going on Clay and when can we expect our next fix?! Cheers! I think he’s building up he tension! I know… I can’t wait any longer, my brains’ gonna explode! By the way… saw Bolt today… excellent job on the animation and kudos to all the animators (including yourself) who worked on it! Saw Bolt a week ago, favorite character is Rhino! My compliments to the podcast chef. This is my last comment, I think. Yes. I’m going to stop commenting and let others get more. Sorry for those comments, Clay. I’ll still listen to your podcast shows. Oops! I loved that timeline, but now the link does not work.